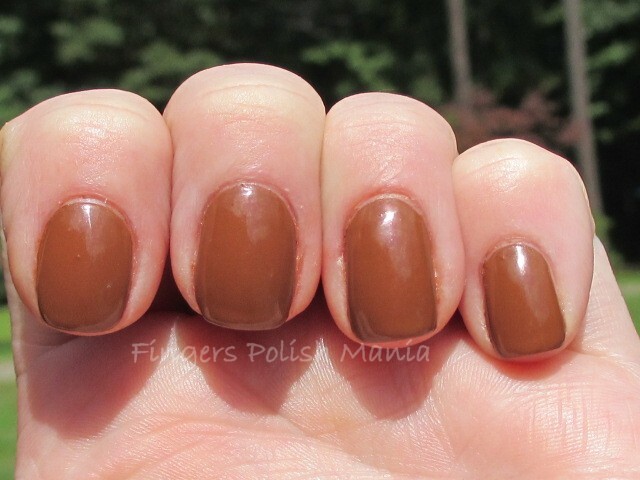 fingers polish mania: It's a Brown Fest! Now before you go running away because you don't like brown polish, stick around. I think this mani may just change your mind. 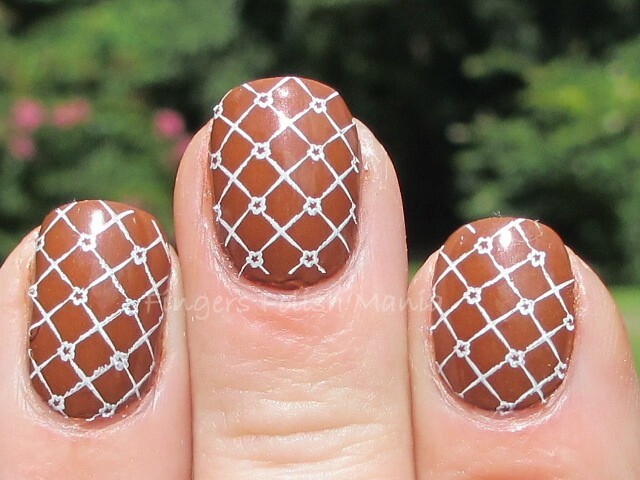 I decided that I wanted to do a full mani with my new all time favorite brown that I had shown you the other day. 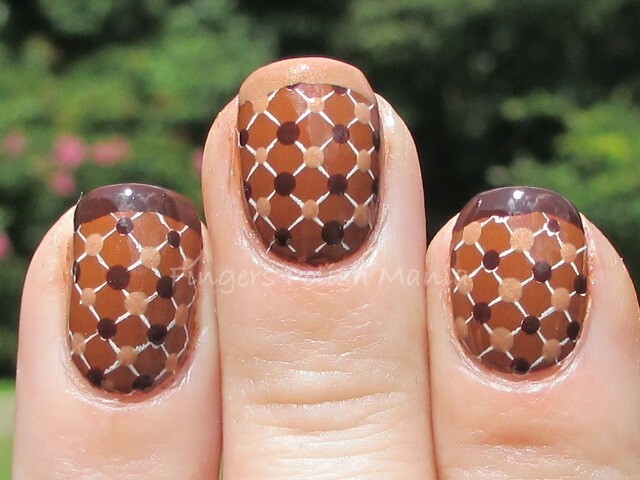 That day, this brown was just the accent nail and I knew it needed to be the star. I also wanted to do a mani using several different browns to showcase how pretty they look together. Sort of a me mani. This is Bettina Brown-gotta love that name right? Elevation Polish Monturull and Bettina Magnolia. I started with Monturull, my new favorite brown of all time. This is a gorgeous melted milk chocolate color. Here are the beginning shots. Isn't this the most gorgeous brown you've ever seen? I am definitely in love here people! Next I stamped with Sally Hansen Whirlwind White using BM plate 310 from the new set. I am telling you, this set is well worth the price of admission! Here is that step. Are you still with me here? 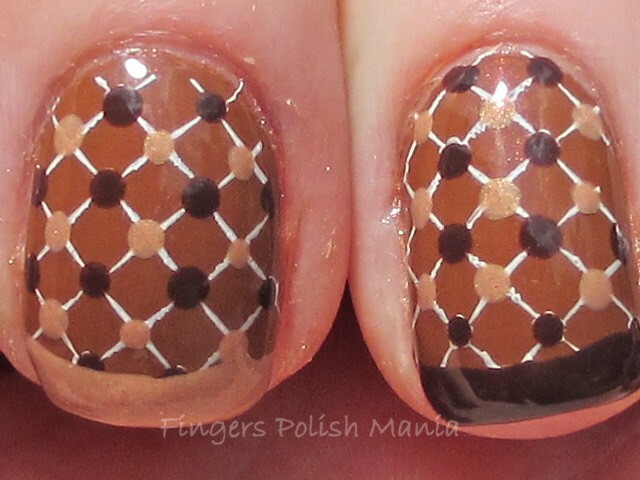 I next did dots with the other two browns. Here is that step. Oh how exciting! Are you ready for the finale? I added my funky alternating the browns I dotted with. I chose not to add my usual sparkle so as to not detract from the browns. Here are the glorious and my new fave mani of all time results! So? Have I converted you to a brown lover? I cannot stop staring at my nails. I have created my perfect mani here. It will be going into my new updated header. That's how much I love this! Do you agree that sparkle would have ruined this? Speaking of sparkle-I talked to a girl at work whose name is Sparkle. I just had to ask if it was her real, on her birth certificate name. She said it was. WOW! That mom must have been doing drugs or was a hippie in her younger days! HAHA! No offense to all those out there named Sparkle! Since I am going by Fingers-I shouldn't talk!